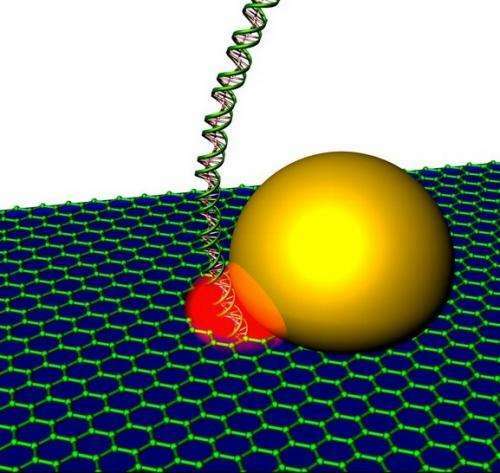 Schematic drawing of graphene nanopore with self-integrated optical antenna (gold) that enhances the optical readout signal (red) of DNA as it passes through a graphene nanopore. (Phys.org) —High-speed reading of the genetic code should get a boost with the creation of the world's first graphene nanopores – pores measuring approximately 2 nanometers in diameter – that feature a "built-in" optical antenna. Researchers with Berkeley Lab and the University of California (UC) Berkeley have invented a simple, one-step process for producing these nanopores in a graphene membrane using the photothermal properties of gold nanorods. "With our integrated graphene nanopore with plasmonic optical antenna, we can obtain direct optical DNA sequence detection," says Luke Lee, the Arnold and Barbara Silverman Distinguished Professor at UC Berkeley. Lee and Alex Zettl, a physicist who holds joint appointments with Berkeley Lab's Materials Sciences Division and UC Berkeley's Physics Department, were the leaders of a study in which a hot spot on a graphene membrane formed a nanopore with a self-integrated optical antenna. The hot spot was created by photon-to-heat conversion of a gold nanorod. "We believe our approach opens new avenues for simultaneous electrical and optical nanopore DNA sequencing and for regulating DNA translocation," says Zettl, who is also a member of the Kavli Energy Nanoscience Institute (Kavli ENSI). Nanopore sequencing of DNA, in which DNA strands are threaded through nanoscale pores and read one letter at a time, has been touted for its ability to make DNA sequencing a faster and more routine procedure. Under today's technology, the DNA letters are "read" by an electrical current passing through nanopores fabricated on a silicon chip. Trying to read electrical signals from DNA passing through thousands of nanopores at once, however, can result in major bottlenecks. Adding an optical component to this readout would help eliminate such bottlenecks. "Direct and enhanced optical signals are obtained at the junction of a nanopore and its optical antenna," says Lee. "Simultaneously correlating this optical signal with the electrical signal from conventional nanopore sequencing provides an added dimension that would be an enormous advantage for high-throughput DNA readout." A key to the success of this effort is the single-step photothermal mechanism that enables the creation of graphene nanopores with self-aligned plasmonic optical antennas. The dimensions of the nanopores and the optical characteristics of the plasmonic antenna are tunable, with the antenna functioning as both optical signal transducer and enhancer. The atomically thin nature of the graphene membrane makes it ideal for high resolution, high throughput, single-molecule DNA sequencing. DNA molecules can be labeled with fluorescent dyes so that each base-pair fluoresces at a signature intensity as it passes through the junction of the nanopore and its optical antenna. 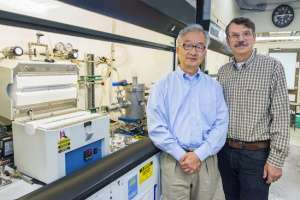 "In addition, either the gold nanoplasmonic optical antenna or the graphene can be functionalized to be responsive to different base-pair combinations," Lee says. "The gold plasmonic optical antenna can also be functionalized to enable the direct optical detection of RNA, proteins, protein-protein interactions, DNA-protein interactions, and other biological systems." The results of this study were reported in Nano Letters in a paper titled "Graphene Nanopore with a Self-Integrated Optical Antenna."